Not sure what to eat on a tight budget? 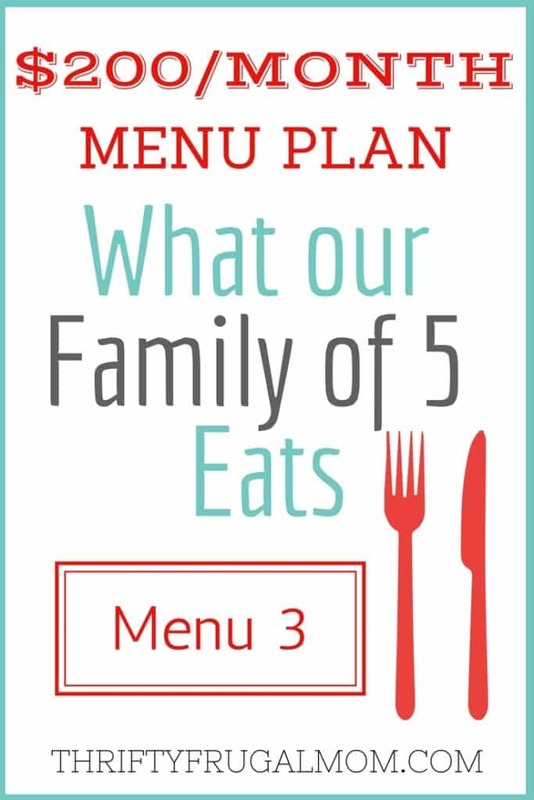 Here’s the menu that our family of 5 enjoys. It even includes links to simple, easy, healthy recipes! Yes, these past two weeks were rather busy and I had some unexpected things come up that took more time than I had anticipated. As a result, meals were kept very, very simple. Not that we ever eat very fancy meals…but still. I realized as I was typing this up that most lunches were a main food and then homemade yogurt, peaches and blueberries. I know that might sound awfully boring to some of you, but honestly that routine simplifies our life and makes lunch time so much easier. But more than that, our children actually love it so much that if I say that we aren’t going to have peaches, blueberries and yogurt, most days mutiny breaks out! Well, not quite. But there are typically major protests. I think it’s partly the routine that they love- kids thrive on routine you know- and partly the fact that they truly do enjoy the food itself. Our family of five consists of two adults with fairly big appetites, a 6-year-old boy, a 3 year-old girl and a 14 month-old girl. I have a stockpile- my cupboards are full from previous shopping and here’s why. When I can get pasta for free with coupons, I buy as much as I have coupons for. If I’m able to get flour for $0.50/bag like I did last fall, I’ll buy half a dozen and put them in the freezer to use as needed. I do this as much as my budget allows, on as many items as I can and as a result save lots of money. Then when I go to plan menus, I simply plan our meals around what I already have in my cupboards and freezer, as much as possible. Obviously, I still might have to buy a few things at regular price here and there, but by stocking up when the price is at rock bottom I save a lot. I cook almost totally from scratch. That means when I make a cake, I rarely use a cake mix. (Why should I when this super moist chocolate cake takes all of 5 minutes to mix up?) I make my own bread totally from scratch. I almost never use pre-packaged sauces. I make my own cream soups and pie crusts and lots and lots of other things. Making your own food is almost always less expensive and healthier too! Our breakfasts consist of Easy Homemade Granola or Baked Oatmeal, the occasional bought cereal that I was able to get for $0.50/box and sometimes some fruit too. I know that might seem awfully boring to some of you, but we actually all really enjoy it and prefer it over other breakfast food. I also have a homemade iced coffee, homemade frappe or some other fun beverage every morning. It’s just one of the little things that I do to make my morning routine a bit easier and more fun! – I was having technical issues with the blog and ended up spending a ton of time working on that, so I ditched my original plan and threw this meal together. I had French Bread in the freezer, just waiting for a night like this. – I’ve always love shortbread, but have never made it before. This recipe was so incredibly easy and good too! It was pretty rich stuff with the chocolate chips, so a little went a long way. Away all day celebrating my husband’s aunt’s life at her funeral and then hanging out with extended family. My kids eat cheese, crackers and fruit almost every day for lunch and they love it. We call it our snacky lunch. Oh, my kids would love that lunch, Missy! :) And doesn't it just help simplify things so much to just have that same thing usually? Julie, it's kind of a family recipe. It's from an old cookbook that both my Mom and Grandma used and was a recipe we had frequently growing up. I've thought of posting it here, but wasn't sure people would really enjoy it. :) I can send you the recipe though if you want it. Or you could probably just use your oyster soup recipe and instead of putting in oysters, add canned salmon- just be sure to remove the little bones and skin, unless you don't mind them. And yes, preserving foods is a great way to eat healthy and it usually saves money too- especially if you grow your own or have an inexpensive place to buy your produce. Hi, I would also like the salmon soup recipe. Thanks! I would love that recipe please! Gail, it's a great way to save....and it typically is so much yummier too! I have a 2 adults an 3 growing boys. Ages 17,18&21. They snack a lot an eat a big supper. We spend at least $100 a week. Yes, I am sure 3 growing boys those ages make a big difference in the grocery bill! I already am seeing a difference as my kids get older and am suspicious that next year we'll be forced to up our budget to compensate. There are so many variables that affect grocery budgets and I definitely think it's totally okay if the amount that people spend varies! In fact, I think it's only good and right if the number is different for everyone. Love to read thrifty ideas. however I find it hard to follow as I am allergic to rice and oats which seem to be an almost every meal staple. But I keep reading as I do get some very helpful hints! Oh, food allergies always make it so much harder, don't they? I've been very grateful that we haven't had to deal with any so far, but I know it would make meal planning a lot trickier. Glad you were still able to find some helpful hints! My husband has to keep reminding me that our youngest children, now 9 and 11, eat 'real people' portions!! Our son, in particular, age 11, has developed a huge appetite. I'm now teaching both little ones to make bread in the bread machine - since they eat a tonne of it! They also eat lunch at school throughout the school year and we make that at home. The thermos helps a lot so they can have a hot lunch; I found that even grilled cheese sandwiches can go in the thermal container. We only serve juice to the children at lunch at school since the milk warms up in their lunch and they don't like it much. We eat most food at home, and even for my son's birthday dinner, we are making homemade pizza and watching a movie at home (his choice of movie). Anne, I often wonder how much food I'll need to make once our children get a bit older. Already our 7 year old sometimes eats as much as my husband and I. I love how you are teaching your kids to make bread- such a valuable skill to have. I never thought of putting grilled cheese in a thermos, but it totally makes sense. Sounds like you have the whole creative lunch thing down, which is saying a lot I think, because it can be so hard to be creative with packed lunches. 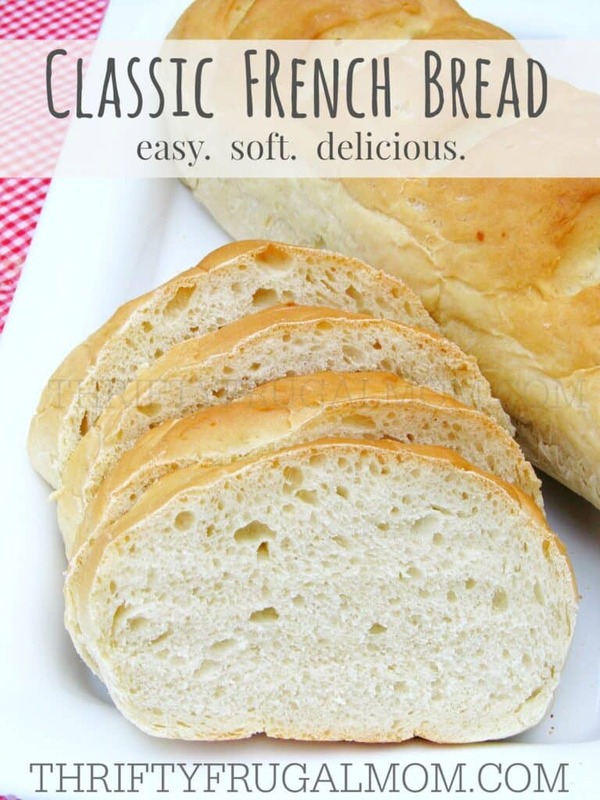 Can I make the French bread in my bread machine! I would think so, but honestly, I have never used a bread machine in my life, so I'm not much help to you as far as knowing how to make the changes that you'd need to make. Hi. I love your site and great meal tips. I would love your salmon soup and vegetable soup recipes. Thanks! Thanks so much, Frances, for your kind words! I'm so grateful and encouraged that you are enjoying what you find here. :) I just sent you an email with the recipes that you requested. I hope you enjoy them!